Every time, Edward Snowden shares a new revelation about government spying, we get an influx of new users. StartPage.com and Ixquick.com are bracing for continued record growth in 2014 as consumers seek out more private Internet services. In 2013, these search engines saw their traffic numbers double, as they surpassed 5 million total daily searches and served up over 1.25 billion searches for the year. "Every time Edward Snowden shares a new revelation about government spying, we get an influx of new users," said company spokesperson and privacy expert Dr. Katherine Albrecht. "He has promised to reveal more in 2014, and from what we've heard, he's got two more years of content, at least." She notes that consumers are upset that popular search engines spy on them in order to create personal profiles and serve up targeted advertising. On top of that, she added, "Consumers are rightfully outraged that governments are eavesdropping on those services and commandeering access to those databases." Albrecht points out that StartPage and Ixquick are different because they are located in Europe, where consumer privacy is better protected by law. What's more, they simply cannot turn over data since they don't collect any to begin with. The company's privacy promises are audited and certified by an independent organization, Europrise, which makes its services very attractive to consumers seeking safer alternatives. Because of customer demand, StartPage and Ixquick executives launched a new privacy-friendly email company: StartMail.com. While they expected a good response, they were shocked when over 50,000 people signed up to beta test the new service, which is rolling out this year. "We thought we'd get interest from a few thousand people, but the response was so overwhelming, we were forced to close the beta signup early," said Albrecht. "It may have taken Internet users a while to make sense of Snowden's revelations and figure out what to do about them, but now they are clearly responding in huge numbers," Albrecht observed. "The backlash against government intrusion into the lives of average citizens is making private search and email services a hot commodity in 2014." 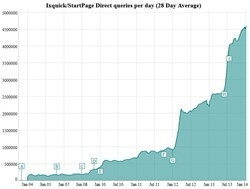 StartPage and its sister Ixquick combined are the largest anonymous search engines, and the only search engines that are third-party certified. They are also the only search engines to offer a free proxy service, and consistently outscore other search engines on security measures. For more information, please see StartPage.com or Ixquick.com. StartMail.com is the new paid private email service that simplifies PGP encryption and makes state-of-the-art privacy protection easy and available to everyone. StartMail is based in Europe, where consumer privacy is better protected by law. See why more than 50,000 people have already signed up to beta test StartMail by watching the video overview at https://www.startmail.com/.